If there's any one key ingredient that is critical to cooking Thai food, it is fish sauce. This is a must-buy ingredient. It smells terrible, but makes make Thai food taste great. Fish sauce is made from small fish and salt fermented for a long time. My mother makes hers in a big earthen barrels, the size that would fit a person. She would let it sit in the sun with salt. She would add pineapple to help digest the fish. After a year, she would extract the juice, filter and boil. That would be her gift for every occasion. Good fish sauce should be clear and brownish in color. A really good fish sauce should have a good fishy smell! Fish sauce is not new, it was very popular in around the Medeterranian in Roman times. I once heard a report that the fishermen of Galilee were catching fish to be made into fish sauce. In Thailand, the gourmands and well to do folks buys boutique fish sauce. Unfortunately, the boutique fish sauce places are too small to make it outside of Thailand. If I could I would love to import my mother's fish sauce. Tipparos was the first brand that made it to the market and eventually to most people's kitchen - when people stopped making it themselves. There are now a number of other great brands available available. Since Tipparos was the first, you sometimes see a other brand which try to copy their original bottle's shape and mimic them with names like "Taperos" or "Tips". Shredded bamboo shoots boiled in wild Thai leaves with hot lime sauce. Ground beef and bamboo shoot red curry. Chicken in galangal flavored coconut broth. Sour and hot. Okra crispy fried in a light batter served with chili fish sauce. Grill fresh sardines, served with hot chili fish sauce. Squash blossoms, lightly dusted in flour and pan fried. 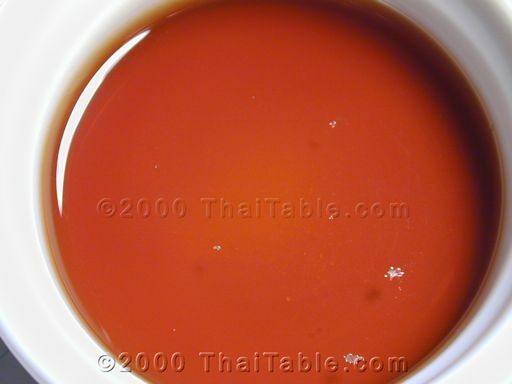 Chili fish sauce is one of the most popular sauce that you will be served with in Thailand. Crab fried rice served with a wedge of lime, sliced cucumber and chili fish sauce. Manila clams in spicy basil sauce. Sour unripe mango, biting lime, salty fish sauce and crisped catfish. Sweet and sour sauce for steamed giant noodle rolls. Stir fried chicken with julienned ginger and wood ear mushrooms. A simple sauce that with wonderful toasted rice aroma. Medium rare grilled steak, served with spicy shallot and lime sauce. Mackerel and fresh vegetables with a shrimp paste sauce. Marinated and grilled pork served on skewers with peanut sauce. A simpler recipe. Thick curried peanut sauce for dipping satay in. Steamed, marinated fish in curry paste and coconut milk on vegetables. Squash stir fried with garlic and pepper. Hyper-bitter neem leaves and blossoms and hot sweet tamarind sauce on grilled shrimp . Sweet and sour sauce, made from palm sugar and tamarind. A variety of tropical vegetables with sesame curry sauce. Sweet and sour (by tamrind) hot sauce with chopped cilantro. Spicy ground pork stir-fried with fragrant holy basil. Served over jasmine rice, a fried egg and garlic chili fish sauce. Easy versatile condiment for most dishes. Loofah stir fried with egg, a meaty vegetarian dish. Turmeric and lemongrass marinated grilled chicken. Easy stir fry bitter melon. Green curry made with chicken and pea eggplant. Hot and sour, lean chicken soup with lemongrass and galangal. Thin, sour, fiery hot curry from Southern Thailand. A clear broth soup with a well blended bitter, sour and salty flavors. Spicy northern Thai raw eggplant salad with minced pork. Spicy grilled beef salad with toasted rice. Crunchy sweet and sour rice noodles. Creamy and mild pumpkin curry. Spicy glass noodle salad with crunchy peanuts and dried shrimp. Sweet and sour crispy fried rice vermicelli served with beansprouts and Chinese chives. Clear broth soup flavored with fresh bamboo shoot. Roast duck curry in red curry sauce with cherry tomatoes. Rice mixed with shrimp paste spiced with shreded green mango and shallots served with fried egg, sweetened pork.